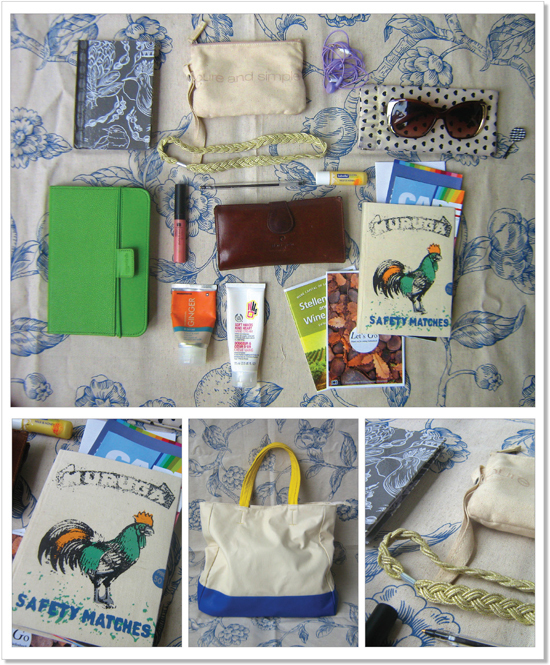 Ruby + Swallow: What's in our handbags? Can you believe its already the middle of January? The holidays feel like they were an age away! Getting back to the grindstone of work, and getting into the year certainly does take its toll. What did you get up to this holiday? We both went to Cape Town for fabulous end of year breaks, respectively, and came back with lovely tans, empty bank accounts, and very full handbags! The New Year is all about spring cleaning and rejuvenation; so when we cleaned out our handbags, we documented it so that we could give you all a sneak peek into what was inside them. Shall we take a look? The items in a girl’s handbag are always close to her heart. See what’s currently hanging out in mine, and what is close to my heart: (from left to right): Every year it is my tradition to buy a new notebook, and this beautiful book was a gift from my mother. I can’t go anywhere without my Kindle, as I am an avid reader and this is the best travelling companion! Years back I purchased DKNY Pure perfume, and it came in this “pure and simple“ case - since then I’ve used it as a bag for my handbag make-up. The gold hair band and pink lipgloss are both from Woolworths. The pen is a necessary partner for my (as yet unwritten-in) notebook. My purse is from Pierre Cardin. I am obsessed with handcreams, and as you can see I carry two in my handbag - one is from The Body Shop and the other from Woolworths. The sunglasses and case are both from Mr Price, and my Milk & Honey Labello is a must for everyday lip moisturising. Last but not least is the notebook I purchased for myself while on holiday in Cape Town; it is from Big Blue, and inside it you can see all the touristy pamphlets I collected at each place I visited. My bag was a handy buy from Mr Price. They say you can tell a lot about a girl from what they carry in their handbag - and mine is no exception. Before I spring cleaned, here’s what you could find in my bag (from left to right): I carry Revlon Pink Happiness deodrant with me wherever I go, and the Woolworths Shimmer Lotion was a perfect summer holiday moisturiser. The purse is a regular occurrence, but this Guess purse was a lovely Christmas present - although it is empty from all the holiday shopping! 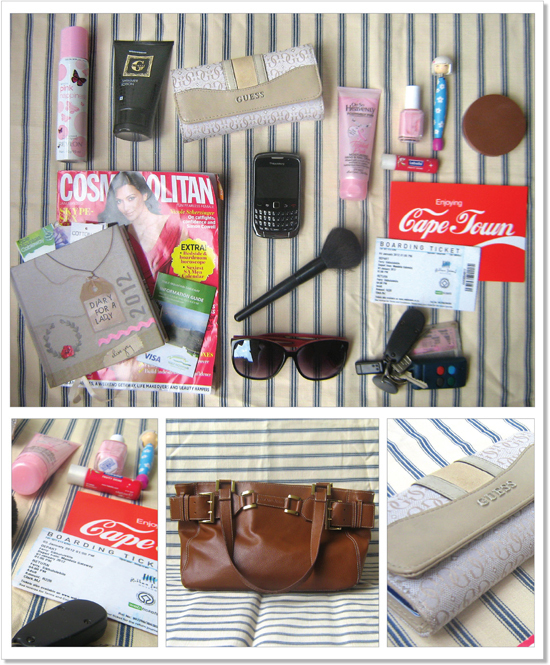 My Cosmopolitan magazine kept me entertained on my flights to and from Cape Town, as well as while lying on the beach. It is my tradition to buy this Elise Grey “Diary for a Lady“ every year, and this year’s copy is absolutely beautiful; it fits perfectly in my handbag and suits my incessant list-writing needs, helped by my “Kimmi“ pen from Exclusive Books. Next is my Blackberry and Oh So Heavenly handcream, both of which never move from my bag! My powder make-up brush is for the Clinique Bronzer, and the sunglasses are from Mr Price. Essie in the colour "Its in the bag" is a nailpolish dream, and the Labello red is perfect for a coloured moisturiser. Below that is a postcard I bought from a shop in Kalk Bay, and my ticket for a trip to Robben Island, and lastly you can see my keys. Do you have any similar items hanging out in your handbags? Click on any of the links to browse for these products or something similar online. And then let us know about your handbag hoarding habits!